Archbishop Fulton J. Sheen speaks on AM530 (CIAO) radio in Toronto. Sunday February 3rd, 2013. Bishop Sheen speaks about What Man Is. Also a Catechism Lesson about the World, Souls and Things. Bishop Fulton J. Sheen on AM 530 (CIAO) in Toronto on January 21, 2013. 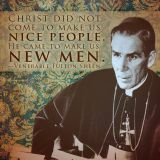 Bishop Fulton J. Sheen on AM 530 (CIAO) in Toronto. Sunday January 13, 2013 at 2:00 p.m. The Venerable Archbishop Fulton J. Sheen on AM 530 (CIAO) - April 7, 2013.